A while ago I wrote about the perils of the eating scene, how to rescue them from dullness by injecting a few forms of conflict. Most of us include restaurant or sitting-down-for-coffee scenes in our books. They are a natural part of life and provide an opportunity to delve a little deeper into relationships. Those relationships can be between friends, family, or potential lovers. An eating scene can also be a “breather” in an otherwise relentlessly-paced thriller. It helps sometimes to slow down the pace. The trick, of course, is not to make things too slow. One technique to keep these scenes from bogging down is called the jump cut. This is a screenwriting term referring to a scene that jumps slightly ahead in time while staying in the same location. It’s used to excise irrelevant or otherwise dull material, so only the “good stuff” remains. 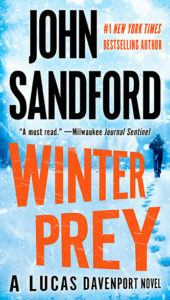 John Sandford uses this technique in his thriller Winter Prey. The hero, Lucas Davenport, is an ex-cop now living in Wisconsin. The local cops ask him to to take a look at a murder scene. There he encounters a small-town doctor named Weather Karkinnen. She is smart and straight-talking. Naturally, there’s a bit of a spark between them. Several chapters later they see each other again. Davenport asks Weather to have dinner with him. She suggests a local joint that offers a wine choice—red or white, with breadsticks on the table. As they walk to the restaurant from the parking lot there is a small interchange of backstory material. AFTER A CARAFE of wine: “Do you worry about the people you’ve killed?” She wasn’t joking. No smile this time. “CARR SEEMS LIKE a decent sort,” Lucas said. “He is, very decent,” Weather agreed…. “YOU DON’T ACT like a doctor,” Lucas said. And so we get through a long restaurant conversation without needless filler. It flows nicely, the conversation getting more intimate as it goes along, so by the end of the chapter we’re pretty sure these two will soon be lovers. It’s also a nice break in what is essentially a police procedural. Injecting tension by giving the characters different agendas. Adding conflict by giving at least one of the characters a fear or worry about something (something they don’t want to reveal to the other). Cutting filler by using the jump cut. For a hilarious movie example of the jump cut, here is a scene from the Preston Sturges classic, The Lady Eve. Barbara Stanwyck plays a con woman who schemes to marry the straight-laced heir to a fortune, played by Henry Fonda. She doesn’t expect to fall for him, but she does. This entry was posted in scenes and tagged Barbara Stanwyck, Henry Fonda, John Sandford, The Lady Eve, Winter Prey by James Scott Bell. Bookmark the permalink. A good tip. And that’s the first time I’ve ever seen Stanwyck when she wasn’t white haired! Ah, you know Big Valley Barbara. What a treat you have in store. She was one of the great screwball comedy actresses. Check out Meet John Doe, Ball of Fire, Remember the Night! Check out all of her movies – she’s amazing. But if you can’t use your Numbers 1 and 2, then 3 is definitely the way to go. That Stanwyck/Fonda video is perfect and so funny. The intense background music and the drama of the train made the punchy dialogue even funnier and the characters played everything so straight. Great example with subtle humor. Thanks for the tips and the examples. I love adding tension to a dialogue scene or having the characters playing a cat and mouse game of subterfuge. Adding body language that contradicts the lines of dialogue can be fun too. But I hadn’t thought of using white space or leaping from one line to another to show time passing. I’ll have to try it. Thanks, Jim. Have a nice Sunday. Ha! “Sweet forgiveness” didn’t last long. Enjoyed the clip and the great advice. Thanks, Jim. Thanks, for the tips. I’ll have to try the white space. The movie clip was so clever, with the body language at odds with the dialogue and I loved the sign advising passengers to pull in their heads because of the approaching tunnel! Each time we were pulled back into the scene, their dialogue had heaped new names on the pile…I enjoyed the morning chuckle. Excellent advice. Thanks, Jim. 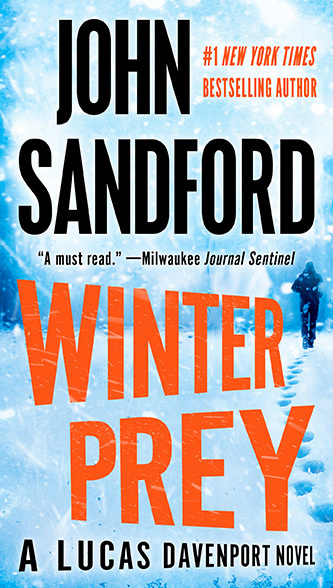 The film clip illustrated the technique perfectly, but I’m going to buy Winter Prey to study the technique further. Jack Higgins also uses a similar technique in his books, as does Lee Child in his Reacher series. (I’m gearing up to write my first thriller, so this is an important bit of information for me.) I love techniques that can be used across the genres. Thanks for the teaching. Another great technique to add to our arsenal. That’s why I follow this blog: Always a constant changing menu of writing tips. Re: the clip. Preston Sturges was a shooting star in Hollywood for six or seven years, writing and directing a string of hit comedies. His fortunes dropped when he left the studio system, but before that he made classics like Sullivan’t Travels and (my favorite) Hail the Conquering Hero. Always great dialogue. Great tips, and I love the Stanwyck film, which holds up to repeated viewings. Somehow I missed The Lady Eve. Gotta check it out. Stanwyck and Fonda crackle in this scene. I miss consummate pros and and great actors doing intelligent scripts. Sometimes I am shocked by how often my characters eat or grab a cup of coffee. Great timing for sharing this post! It gives me a technique I can use to revise a Thanksgiving meal scene that’s too long right now. Thanks!